It is that time of year again, when pots and pans are used often. I personally like the simple, quick and easy recipes. Like this roasted potatoes with turkey and mushrooms. How much can or should a person really eat in one sitting? Not much. Keep in mind the "Hara hachi bun me" rule, which means to eat until you are 80% full. What a good rule to keep in mind this holiday season. Eating lots of potatoes is good for the growth and repairment of the body's cells due to its high vitamin C content. Potatoes are a rich source of potassium, they contains more than a banana! Potassium improves your health by relieving stroke, blood pressure, heart disorders and kidney disorders. While turkey is a seasonal dish, dig in and gain all the health benefits! Turkey contains vitamins that are essential for energy production: vitamin B6 and niacin. To top off the abundance of health all these ingredients contain, there are mushrooms that boost the immune system if eaten daily. Hope you love this yummy, and filling dish! Wash and chop 1 pound of Yukon potatoes into fourths. Place into an oven safe dish. Drizzle potatoes with 2 tablespoons extra virgin olive oil and 1 teaspoon of salt. Place in the oven for 35 minutes, uncovered. Meanwhile, saute chopped bacon for 1 minute. Add 1 teaspoon olive oil, 1/8 teaspoon salt, and sliced mushrooms. Stirring occasionally, saute until mushrooms begin to brown. (3 minutes). Adding 1 minced garlic clove, cook for one more minute. 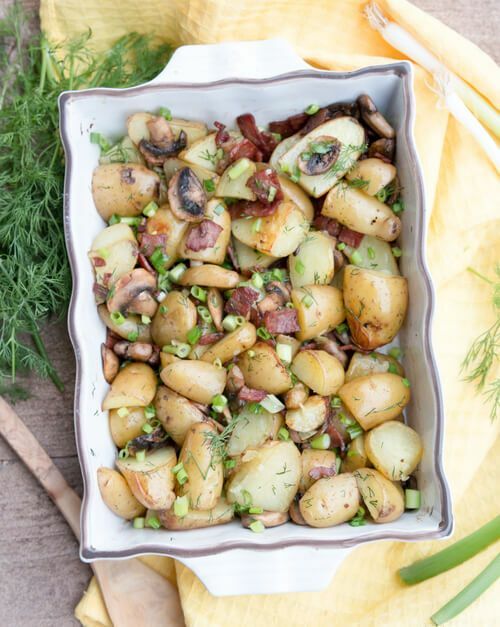 When potatoes are ready, stir in mushroom and bacon mix. Garnish with chopped dill and green onion.